Our company is among the most sought after offering Curtain Rail to the clients. UPVC Curtain Rail is precisely manufactured using pristine grade material and high-advanced technology in adherence with the predefined norms of quality. Offered range is checked on toughness and strength parameters by the quality inspectors to provide a flawless range to the clients. Custom designed cubical curtain track system for hospitals providing privacy to the patients whenever they so desire. The curtains are ceiling mounted & cover all the exposed sides of a bed giving well deserved privacy to the patients & enhancing the aesthetics of the room. The curtains are fitted on the track using smooth gliding rollers for easy movement. We are acknowledged for providing safe transaction modes for the payments which include online as well as offline method. Thus, we accept debit cards, credit cards, bank account transfers, direct credits, cash payments and more. Our organization is highly concerned towards providing excellent quality products to the customers and thus check them at all stages. The G-Rail hospital curtain rail has been the industry standard in the health care sector for years. Functional, strong and available with a dust-resistant PVC cover strip. Also available with handy accessories such as the IV rack, IV hook, curtain holder, etc. The rail can be mounted either on the wall or on to the ceiling, of course, so that a solid system can be built. We. 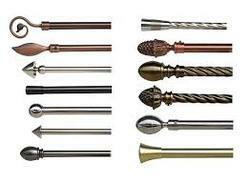 With the aid of our technologically advanced manufacturing section, we are able to offer excellent quality Curtain Rod. 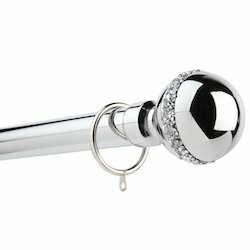 We are trusted by consumers for offering high quality embedded Curtain Rod. This product is widely demanded in homes and hotels.